As robotics moves center stage, understanding its market dynamics is becoming a business imperative for more and more industries. This can be difficult for the outsider – to begin with, there is no one robotics market: traditional industrial robots are a mature sector with established rules and players and stable growth – while new segments are emerging fast, with prospects for future technology that are difficult to predict. Rules are undefined and ethical implications yet to be fully understood. The process of definition and understanding will be a bumpy ride. Given technology complexity, the fast pace of change and differing business models, understanding the robotics market can be hard for investors, executives, and customers alike. This article aims to provide a high-level, “drone’s eye” view of the sector, identifying some key considerations to help make sound decisions in this challenging environment. 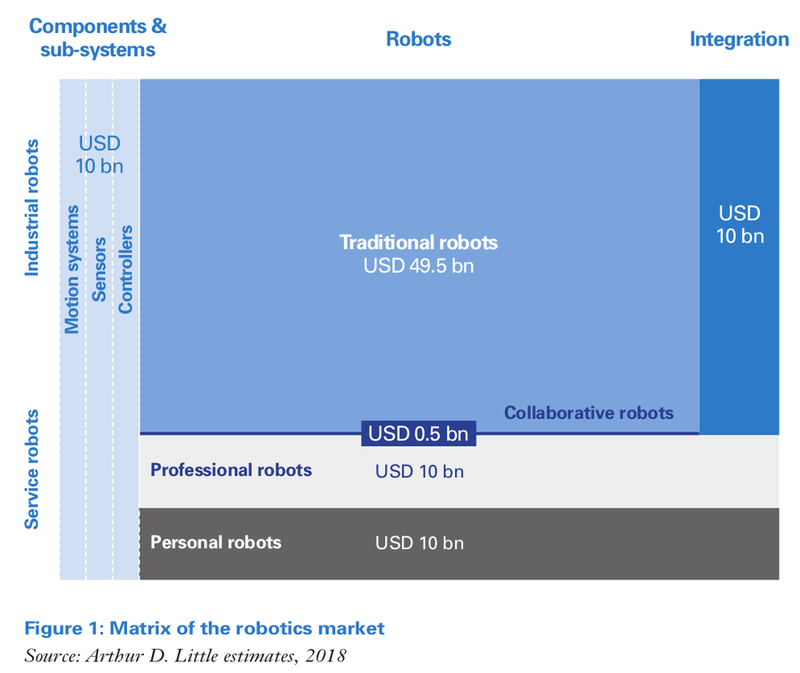 It is helpful to segment the robotics market based on two axes – user purpose and application-agnostic value chain components. In this user-based perspective we include suppliers of software and components, end-user robotics producers and end-user robots. Our matrix shows a vast market that will soon hit $100 billion in revenues, which can be further organized into sub-segments. It will be apparent that technology and algorithms may be applicable across multiple segments. For example, perception systems for autonomous wheelchairs, as well as unmanned demolition and nuclear decommissioning robots, may face similar environmental challenges. These challenges may include discriminating between objects to either avoid, shove, or otherwise manipulate, and coping with artificial lighting, flat/shiny surfaces, etc. Traditional industrial robots are sizable with stable, comparatively low growth rates but good profitability level, largely resulting from a capital-intensive operating model. The industrial co-bot segment is rocketing size-wise thanks to flexibility that enables new applications, as well as its affordability to new segments with smaller customers attracted by lower capital needs, less demanding integration and more software-oriented offerings. As in any emerging segment, the risk-reward trade-off is more uncertain than in mature markets. A recent example of an, according to most observers, attractive-looking company that fell flat was the pioneering Rethink Robotics. Professional robots cover many segments, such as surgical robots in healthcare. The market has high profitability thanks to the specificity and high-end features. The market benefits from rapid technology development of components, such as high-precision actuators, smart sensors and computer vision. Personal robots are increasingly popular and consumer demand has risen notably in recent years, but market fragmentation thanks to a plethora of new entrants, and subsequent price pressure, are eroding margins. In the remainder of this article, we will focus on the end-user-based segments of industrial and service robots. With $50 billion of revenue, industrial robots represent the largest segment in the market. It is forecasted to grow at 12 percent CAGR until 2021, driven by increasing productivity demands and digitalization trends in manufacturing, such as Industry 4.0, digital twins, and smart manufacturing. The sector can be split in two. Traditional robots, known from production lines, have limited interactions with humans and are placed behind fences or in cages. 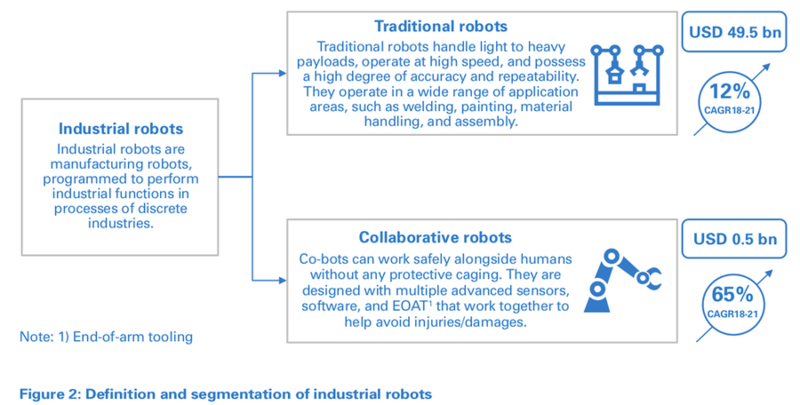 By contrast, newer, collaborative robots – “co-bots” – are designed to work safely alongside people. In general, co-bots have lower costs, weight, and footprints, and are fence-free and easier to program and integrate. However, payload limits and accuracy are significantly lower compared to those of traditional industrial robots. Developing countries are using them to industrialize, satisfying end users’ desire for cost reduction. Lower prices enable robotics businesses to target new segments, such as SMEs, with innovative technologies (e.g., co-bots). Government initiatives, such as “Made in China” and the EU’s “Horizon 2020”, are contributing to greater robotics investment. 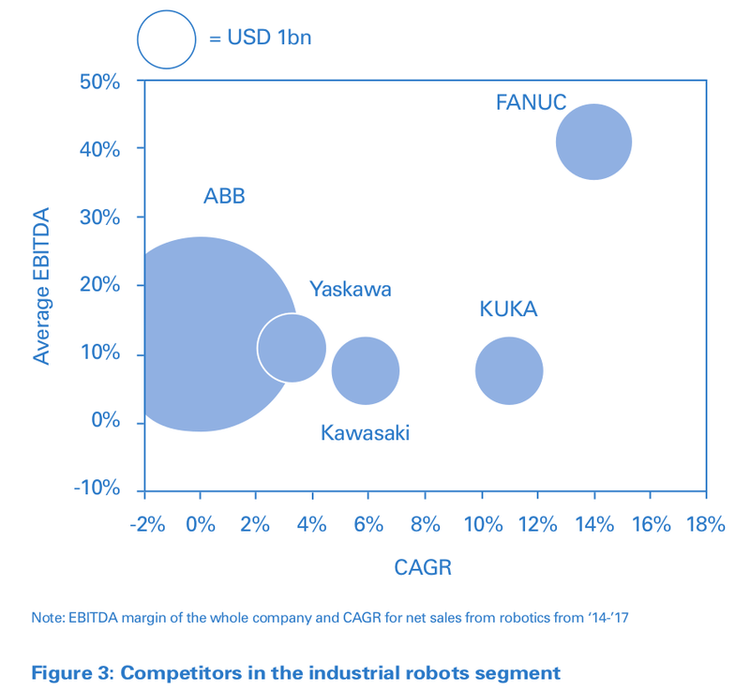 The market is dominated by well-established traditional players such as ABB, KUKA and FANUC, as shown in Figure 3. Co-bots will see the largest growth, albeit from a low, $0.5 billion base. This sector is projected to grow at 65 percent CAGR until 2021. This is partially due to their lower purchasing price compared to that of traditional robots, which extends the robotics market to SMEs. Additionally, as opposed to traditional “co-opetition”, in which traditional robot players struggle for power with third-party integration solution providers, suppliers of co-bots tend to cooperate more closely with consulting/service-oriented integrators. Automation/Industry 4.0 is driving demand for agile, collaborative robots, while the flexibility of the ecosystem enables efficient adoption. For example, KUKA’s high-precision robot, Agilus, played against former table-tennis world champion Timo Boll, which showed the trend towards improved flexibility, speed and agility. Developments in the IoT enable the smartization and connection of tools, driving adoption in medical and farming. Innovations in the field of software and hardware, e.g., sensors, AI, and lightweight actuators, make performance both affordable and value generating. Declining hardware prices and easier integration make robots more affordable for SMEs. Automation levels in China are expected to increase, with the Chinese government investing heavily in robotics. FANUC specializes in robotic automation for manufacturing. FANUC offers 100+ industrial robot models with a range of flexible, application-specific options, handling payloads ranging from 0.5kg up to 2.3kg, reaching from 0m up to 4.7m, with 2–6 axes. FANUC also provides an extensive authorized system integrator network, which helps customers find and deploy robotic solutions that meet their needs in terms of quality, throughput, productivity, and budget. Using a professional system integrator well versed in FANUC’s product range can be a key success factor for a user to get maximum return on their often sizable investment in an industrial robot solution. 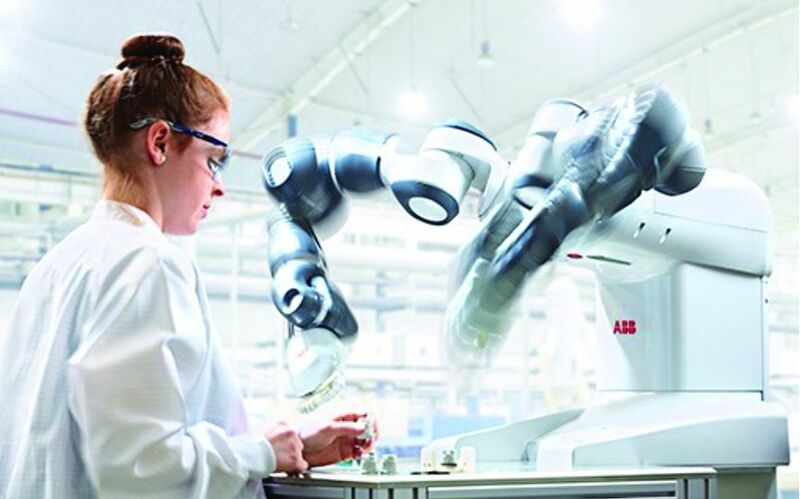 ABB’s first range of cobots was introduced to the market in 2015, and is named after the collaboration it enables: YuMi, for “you and me”. The dual-arm, small-parts assembly robot solution includes flexible hands, parts-feeding systems, camera-based part location, and state-of-the-art robot control. Thanks to accurate vision, dexterous grippers, sensitive force control feedback, flexible software and an easy-to-use programmable interface, YuMi can be instructed in multiple ways, such as to assemble small parts on an assembly line, fix part positions, or even serve coffee. Its sensor set-up enables situational awareness that, paired with built-in safety features, qualifies it for cage- and fence-free work side-by-side with humans. Geography: Technological development and the economic and political environments strongly affect regional market attractiveness. For example, 70 percent of robot-related patent applications between 2014 and 2017 were filed in Japan, the US, Germany, or South Korea. Add China, and these five countries account for 75 percent of industrial robot sales. Therefore, the location, focus and footprint of a prospective business will be an important indicator of future performance and growth. Industry: The use and progress of robotics has developed at varying speeds across industries. In the automotive industry, robotic assembly overtook manual labor in the middle of the 20th century, with the electronics industry following a few decades later. However, other sectors, such as food processing, have still to become as mature. In fact, the effect of robotics on these industries promises to deliver a similar transformative impact to that of the Spinning Jenny on the 18th century textile industry. Consequently, the characteristics and maturity of the customer industries being targeted will greatly impact the success of prospective investments. Technology and business offering: Impressive technology cannot fly without a viable business offer. Take Rethink Robotics: not long ago, its innovative technology was a source of awe and envy from other players within the co-bot market. However, extraordinary technological features could not be translated into a workable solution, and the company was forced out of business in late 2018. Ethical considerations: Industrial robots, especially co-bots, are bound to make many manual tasks redundant. Investors and executives will need to consider what responsibility they have for retraining and/or redeploying affected employees – and to what extent they are able to stand up to public scrutiny on these topics. As the Silicon Valley Robotics Association says, the role of robots in society is moving from “doing dirty, dull, and dangerous work to improving lives of ordinary people”, i.e., from industrial to service robots. While growing from a lower base, the number of industries in which service robots are popping up is expanding rapidly, with sub-segments growing quickly. This immaturity means the market is defined by innovation and fragmentation, and driven by technological advancements combined with increased demand. Continuous improvement in the performance and flexibility of service robots is encouraging their widening adoption in new areas such as the home, the education sector, and offices. 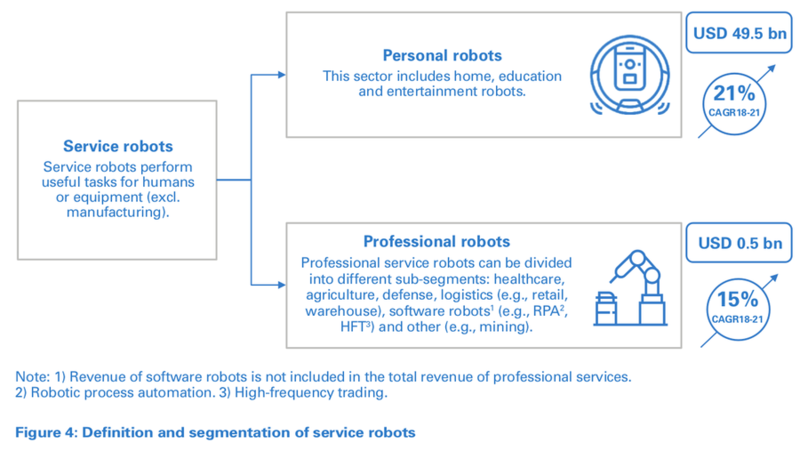 As Figure 4 shows, service robots can be split into professional and private use. A service robot in every home and office? In 2018, both the personal and professional service robot segments were similarly sized, at about $10 billion each. The personal robot segment growth of CAGR 21 percent is driven by changing consumer behaviors, in which consumers accept and demand more solutions to simplify everyday life. On the professional side, the growth rates differ between sub-segments and industry. For instance, robotics for handling financial services is growing faster than robotics in health care, in which regulations can slow down growth. People are increasingly using “virtual assistants” such as Apple’s Siri on their smartphones and Amazon Alexa/Google Assistant at home. For example, Amazon’s Alexa already has a penetration of ~20 percent of US households. Consumer robots such as vacuum cleaners and lawn mowers are becoming default components of smart living and smart homes. Medical, educational, and logistics robots are rapidly changing traditional business operations. Supply and demand for autonomous vehicles and drones is rapidly increasing. The e-commerce boom is stimulating and driving greater adoption of logistics robots. Robotics-as-a-service (RaaS) is increasingly available, which lowers the barriers to entry as robotics systems can now be rented on a monthly or quarterly basis, including technical support, real-time monitoring, and other services. “Robots invest in robots”. The rise of robotics and AI has spurred development of exchange traded funds (ETF) investment, which often leads to robotic systems investing in the sector and technology that created them. Agri-tech company Fendt launched the Xaver solution in 2017, which enabled automated targeted seeding using swarm technology. Utilizing a swarm of battery-powered, cloud-controlled, high-precision field robots that collaborate autonomously, seeding can be performed at exceedingly low cost – for both the environment and the farmer. With few sensors and a clear hardware structure, each Xaver is highly reliable and can leverage the swarm’s collective sensor park. The “modularized” seeding set-up is scalable and avoids single point of failure, and the robot’s light weight ensures improved safety and negligible soil compaction. Sophia – A physical chatbot? In 2016 Hong Kong-based Hanson Robotics launched a humanoid robot named Sophia, which has received extraordinary attention in media across the world. Sophia can make more than 60 facial expressions, and is known for her human-like behavior. In 2017 “she” was made a citizen of Saudi Arabia and named UNDP Innovation Champion. Sophia uses AI, visual data processing, and voice and facial recognition, and is designed to get smarter and ultimately gain social skills. The inventor has said Sophia (or a clone) may be used as a suitable companion for the elderly in nursing homes, or to provide customer service. Platforms: A high-potential platform enables a diverse customer base and underpins new applications, such as warehouse automation platforms that can be applied in different verticals. Reusability of the underlying platform of a product or technology is a vital input aspect to executive and investor decisions. Hyped segments should give rise to caution: A hot and hyped segment normally receives attention for justified reasons, such as groundbreaking technology or potential for business disruption. Still, they are often inhabited or targeted by giant players, which means you need deep pockets to compete. The virtual assistant sector is the perfect example – consumers are eager to adopt these solutions, but the presence of Apple, Alibaba, Amazon and Google will create obstacles for other actors looking to build viable businesses. Possible calamities and liabilities: When dealing with a delicate and high-stakes field, it is necessary to recognize that reliability, regulation, and potential liabilities could have crucial impact on products and companies. Intuitive Surgical’s Da Vinci Surgical Systems provides a case in point. Its path to both medical and commercial success seemed to be set until the company suddenly found itself having to set aside $100 million to fight over 80 lawsuits within 22 US states. Ethical considerations: AI is fueling improved performance for service robots, be it medical image analysis to identify tumors or the smart voice assistant through which you control your vacuum cleaner and order groceries. The very improvement stems from the notion of machine learning – i.e., that an algorithm improves its decision-making and actions based on data from new experiences. Nevertheless, there is a trade-off between big data and quality-assured data. Executives and investors must remain cautious on the quality and use of data, not only to comply with applicable regulation (such as Europe’s General Data Protection Regulation – GDPR), but also to avoid perpetuation of biases. Any corporate executive who has witnessed the start of the Industry 4.0 revolution realizes the potential of robotics. Typically, NPV or payback time is used when contemplating investments, considering the benefits versus costs of replacing labor with robots, along with factors such as improved quality and precision. However, without understanding the context, such investment rules can easily be misleading. Understanding the ecosystem of suppliers, software integrators and end-user robots is key to making the right bets and creating the right assumptions in business cases. Our matrix provides guidance. 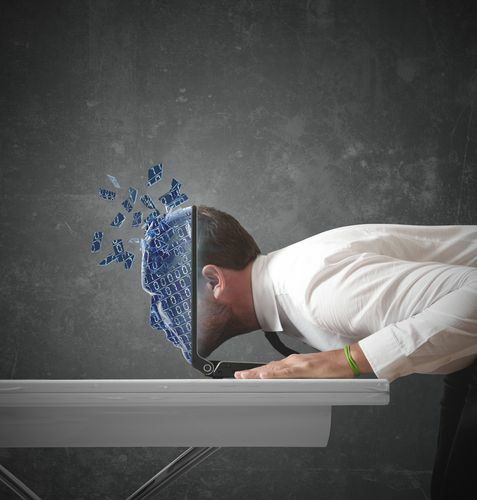 Inspiration can be found from robotics companies that practice what they preach: hardware manufacturers and software engineering companies alike are all robotizing their own R&D, manufacturing and customer support by deploying AI and machine learning. Use cases include FANUC’s and ABB’s automated production of industrial manufacturing robots, Kia seeing a three-fold increase in car sales conversions through its sales chatbot compared to through its website, and cybersecurity companies using generative adversarial networks (GANs) to stress test their solutions. An active private or public equity investor in robotics companies must distinguish between a fascinating technology, a wellmanaged company, and a good investment. Timing is key, alongside a fundamental understanding of robotics ecosystem dynamics, an area on which our matrix and insights provide guidance. A good understanding of the regulatory environment, including predicting its changes and risk dynamics, is key to success in robotics markets. An investor who believes in the robotics sector, but is less knowledgeable and confident in picking the winners, has a more passive option in robotics-focused exchange-traded funds (ETFs). 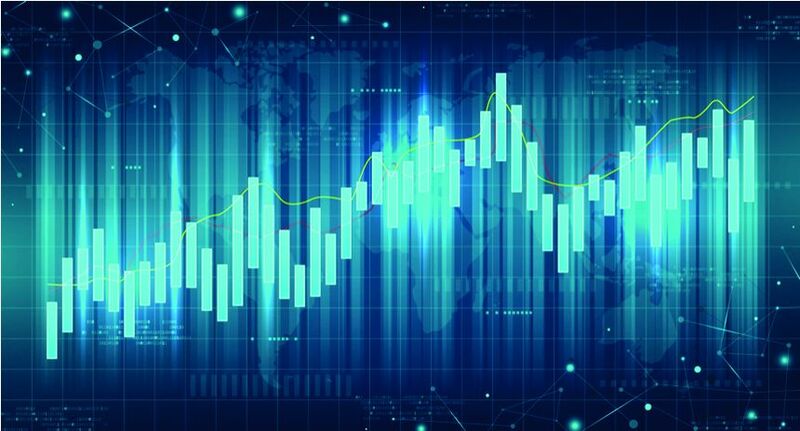 Robotics trading, like high-frequency trading or automated algorithms for fund management, is improving returns and lowering risks for investors in general, and for knowledgeable robotics investors in particular.